Do you tend to find a gorgeous notebook, fall in love with it, buy it, and then just let it gather dust on your shelf because it’s “too pretty to use”? The fear of ruining an expensive notebook with “ugly” content is real. But let me stop you right there! We’ve discovered gorgeous and affordable notebook brands by Urban Traveler & Co – Field Notes and Word Notebooks – and with them, the possibilities are endless! Both brands reflect simplicity with a minimalistic design that notebook hoarders and practically anyone needing a notebook are sure to appreciate. 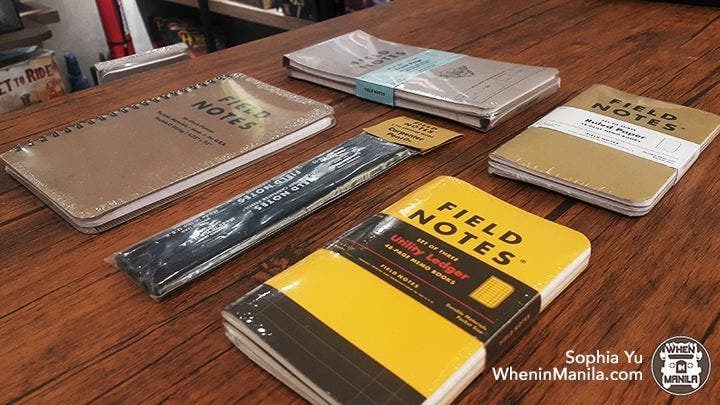 Field Notes offers a wide variety of notebooks – a 56-week planner (Php850), a Front Page/ Reporter’s Notebook (Php750 for a pack of two), an Original Kraft notebook (Php600 for a pack of three), and a Utility Notebook (Php750 for a pack of three), to name a few. Each notebook serves a distinct purpose to best suit the needs of each person, while keeping a fresh and clean look. The Word Notebooks (Php500 for a set of three), on the other hand, have different covers to suit the different personalities of each user. Each pack comes with three 3.5″ x 5.5″ notebooks with 48 pages of lined paper. The paper is smooth and with its size, it’s convenient to bring around in your bag or pocket – perfect for traveling! The Front Page/ Reporter’s Notebook and the Blue Mountain Word Notebook both reflect clarity and simplicity with their sleek and professional aesthetics. Here are some ideas on what to use the notebooks for: daily, weekly, or monthly to-do lists; a packing list for traveling; a bucket list; a grocery list; and more! Don’t be afraid to make the first mark on your notebook as each mark will tell a story and will help you organize your thoughts better. And, hey, once you’ve filled one up, you can store it and look back on it one day and reminisce. The surprising benefits of having two smartphones! JUICE Powerbanks: Got Juice? Power Up Your Gadget with the Juice!